What is the biggest question for the start of the Spring 2019 TSL Season?? How long will it be before teams and players try to "get over" for their own benefit by attempting to pit Topper and Rameer against each other?? Which team will have a player make Taylor Pagano spazz out first - her Breakfast Club team or her D1 squad? Now that the 900th attempt to duck D1 has been thwarted by the league - what's the over/under on how may teams cry "unfair" to Topper in the first 2 weeks? How will both Peachy Platoon and All We Do Is Qwinn adjust to playing in a division where everyone can keep up with their speed and athleticism? What team emerges as THE Bad Guy team this session? And which team will emerge is "the people's team" in terms of being beloved? It's been several seasons since we had a true "bar tab bet" match between teams in different divisions. Will the streak be broken this season? Can Darryl's hair and his dedication to excellence get any more magical than it already is?? How many different versions of "Ferger Juice" will appear at the fields this season? And how many people won't heed the warnings NOT to "chug" it?? Every Breakfast Club captain's name ends with the "ee" sound. Did Topper plan this, or is it just cosmic coincidence? There's Best Bernal, Best Tommy Hughes, and even Emily vs. Emily. Where will the next great friendly rivalry come from this season? New article called "The Sentinel"
Kick off weekend is this Saturday, April 27th 2019. 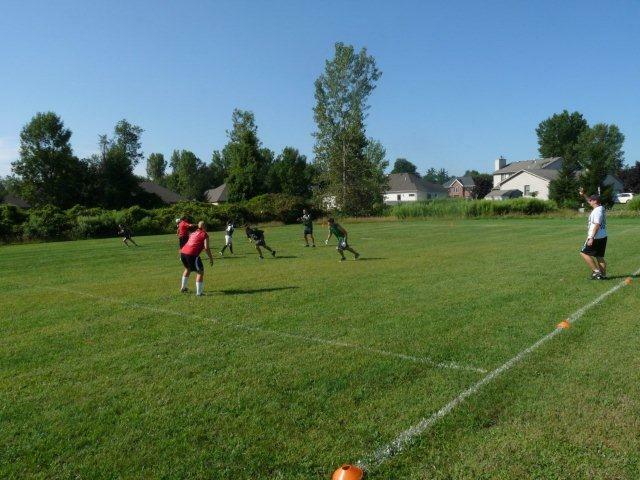 We are very excited to once again get together every Saturday for the next 10 weeks and enjoy the best co-ed touch football league in Buffalo. This season however will be different as earlier this past March, we lost our league Commissioner and my best friend, Lenny Alba. Lenny was a huge influence on the league. It was like playing good cop, bad cop every week with him, whereas I always wanted to make sure the football games themselves were organized and went off without a hitch, Lenny was always one to stir the pot, create, modify or enhance any tidbit of news he had on any player or team. The TSL to us was about 50% football, and 50% entertainment, he’s definitely going to be missed. So be sure to check back on the website throughout the week, for the time being I’ll be leaving the Godfather and podcast links up, and I might even post some historical godfather posts for fun. Thanks again for playing with us this spring, we certainly look forward to getting outside and getting the season started.